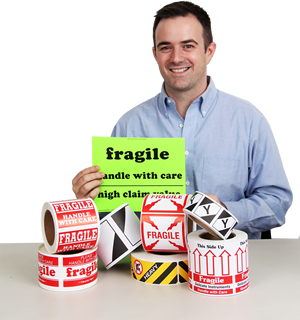 Your online source for shipping and mailing labels. We like to call our shipping labels “ads for safe handling.” Shipping labels on the outside of your package let everyone know what's going on inside. A simple label helps you separate your packages from the rest, with important messages placed right where you need them. • There are more international shipments than ever. • Packages pass through more hands and need to comply with a host of regulations. • More freight travels via air, instead of truck or train. • More packages are drop-shipped. • The worth of everything you buy or send is increasing. It's easy to see why the 2¢ shipping label is such a small, yet important detail. And, when you lovingly wrap your knick-knacks in bubble paper, mailing labels help everything get to where it’s supposed to be going. ShippingLabels.com is dedicated to making it easy and affordable to mark your essential packages. We have low, direct-from-factory prices, offer immediate delivery for stock items, and work with decades of professional experience. We develop or adopt new designs every year to help meet the latest regulations, and we even offer free rolls and free shipping on many orders – there’s a reason why we have so many frequent, satisfied customers. Questions about your labels? Feel free to give us a call. * We’re happy to help you find what you’re looking for. * Send us your shipping story. In turn, we will gladly send you a free pack of labels.